Pondemonium offers hands-on world class training in pond construction techniques, waterfall design, and even pond liner seaming. This year also featured advanced construction offerings for some of the coolest new trends in ponds with a recreational pond as this year’s project. A beautiful natural stone pond with multiple waterfalls, diving rocks, planting areas, hardscape areas, upflow systems, intake bays, external pumping systems, and wetland filtration technology were all part of the project led and taught by the the pond industry’s best. Are you a pond professional that needs some inspiration? Pondemonium had that covered too. A leisurely excursion to Chicago offered a visit to Christy Webber landscapes, an architecture and history tour, and a stop at the Garfield Park Conservatory. Need more inspiration? The Pondemonium guided pond tour made the rounds to some of Aquascape’s most amazing pond projects for up close interaction with pond designs of every size and shape, aquatic plants in full bloom, koi and goldfish bursting with color, and of course waterfalls a plenty. More? The panel discussion with award winning Aquascape pond artists offered some priceless feedback, critique, and humorous insight the into the minds of pond artists’ hows and whys of creating a better design and improving design techniques. The Pondemonium 2017 guest keynote speaker was the one of a kind Heiko Bleher. Heiko seemed to be everywhere; delivering his keynote, providing hands on instruction in creating biotopes, presenting the amazing history of Nishikigoi, and even holding a sold out book signing session. Heiko has been exploring the planets most remote biotopes and cultures for more than 50 years collecting some of the rarest fish species. A true legend and pioneer of the aquarium industry and advocate for planetary conservation. Heiko has travelled the world many times over and has a unique perspective of the world that can only come from first hand experience and observation of the human impact on this planet. His keynote presentation was a disturbingly eye opening experience with images ranging from some of the most delicate and beautiful fish species living (and gone) juxtaposed against scenes of heart breaking man made devastation, polluting, and death of our planets most precious resources and habitats. 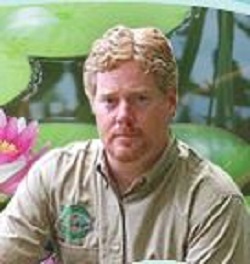 At times the presentation was simply shocking and alarming, but Heiko bridged these images to the efforts of the pond industry and pond professionals everywhere in creating new habitat with every pond we build that can help curb the loss of so many species that would otherwise disappear from our planet. The installation of ponds and water gardens can help be the silver lining to these rapidly developing problems. Pondemonium would not be Pondemonium without plenty of fun too. A night out at Top Golf, Ed’s Beer Garden, The Top Frog Dinner (and bottom toad dinner! ), the annual Blow Out Bash, and of course the awards ceremony recognizing some of the most outstanding pond professionals in 2017. This years CAC (Certified Aquascape Contractor) of the Year went to Sean and April Frost of Naturescapes out of New Hampshire. The Conservationist of the Year went to Kathy Smith of Tropical Water Gardens out of Florida. The Pond Artist of the Year went to Tussey Landscape out of Pennsyvania. The Businessman of the Year went to Matt Griffin of Prime Lawn Care out of Texas. The experience from Pondemonium 2017 is still warm but the the 2018 event is already being planned, and will be the 20th event hosted by Aquascape Inc. Pondemonium is a professionals only event open to all pond professionals. To find out more about next years even check out the Pondemonium website or Facebook page. 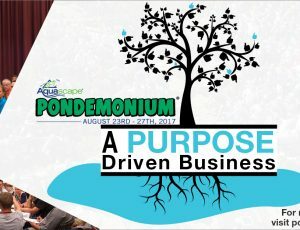 Pondemonium is truly an experience that all pond professionals should make part of the their annual business plan. Congratulations to the entire team at Aquascape for another successful event. Sorry we missed you this year..be there next year.